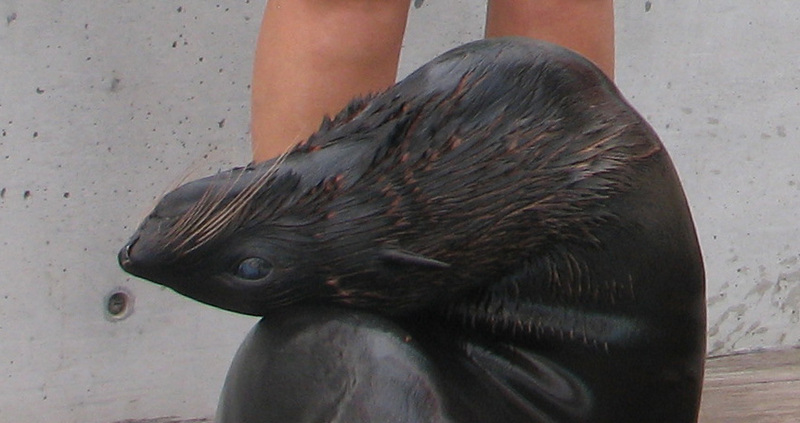 The Northern fur seals are quite limber. We've seen Baranov do a great big head roll with Lindsay, and Isaac do a couple toe taps with Paul. Now Ursula is branching out and stretching with some members of the audience! You see, visitors to the New Balance Foundation Marine Mammal Center often help out during training sessions. In this Fitness Friday post, watch how audience members walk Ursula through some calf stretches, ankle rolls and neck stretches. Come on down to the Marine Mammal Center and you, too, could be out there stretching with the seals! Better yet, sign up for a seal Meet and Greet program for some guaranteed face time. Check out our other New Balance Foundation Fitness Friday posts! Watch how Isaac managed to learn an impressive flipper stand, and see the sea lions romping with a hose for a bit of exercise. Vote for your favorite holiday card! Fitness Friday – Exercise is fun!